Silicon tetrachloride (SiCl4) is one of the primary by-products products of the polysilicon industries, which must also be handled with care, as it is both toxic and reactive. The dissolution of SiCl4 and electrodeposited of Si in ionic liquids (ILs) was investigated. Six kinds of ILs were examined as the solvents; the cations were 1-Butyl-3-methylimidazolium 1-butyl-3-methylimidazolium ([Bmim]+), 1-Hexyl-3-methylimidazolium ([Hmim]+), 1-Octyl-3-methylimidazolium ([Omim]+), N-butyl-3-methylpyridinium ([B3MePy]+), N-hexyl-3-methylpyridinium ([H3MePy]+), N-octyl-3-methylpyridinium ([O3MePy]+); the anion was bis[(trifluoromethyl)sulfonyl]imide ([NTf2]−). The results indicated that a decrease in the solubility of SiCl4 in ILs followed an increase in temperature. 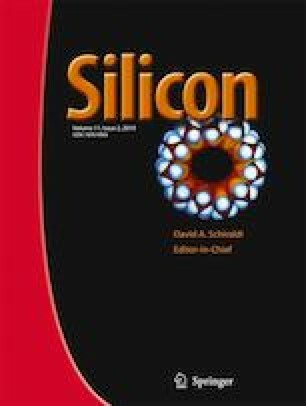 The presence of Si-O bonding between the ionic liquid and SiCl4 enhanced the SiCl4 dissolving capacity of in the ILs with anion of [NTf2]−. Longer alkyl chain lengths in the imidazolium and pyridinium cations of the ILs exhibited a better performance in dissolving SiCl4, due to the presence of C-Cl and C-Si formed between the ILs and SiCl4. Si was electrodeposited on a Ti plate under potential of 2.92V, of which a Si weight of up to 28.43 wt% was observed. The deposition product on the electrode is in the coexistence state of Si and SiOx due to the deposition conditions at ordinary temperature and pressure. This work was supported by National Natural Science Foundation of China [Grants No 51474146]; Natural Science Foundation of Shanghai [Grants No 14ZR1416900]; Gaoyuan Discipline of Shanghai - Environmental Science and Engineering (Resource Recycling Science and Engineering); Key Subject Building Project of Shanghai Polytechnic University [Grants No XXKZD1602].